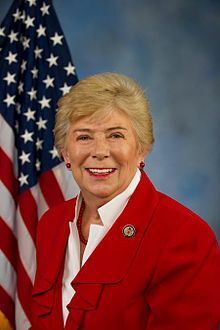 Carolyn McCarthy (born January 5, 1944) is an American nurse and politician who served as the U.S. Representative for New York's 4th congressional district from 1997 to 2015. She is a member of the Democratic Party. On January 8, 2014, she announced that she would not run for re-election that November, citing her poor health; she retired in January 2015 and was replaced by fellow Democrat Kathleen Rice. McCarthy, born Carolyn Cook in Brooklyn, was raised in Mineola, a suburban area on Long Island about twenty miles outside New York City. Her father was a boilermaker and her mother worked at Woolworth. In her youth, she was an athlete and wanted to become a physical education teacher but found reading challenging and later was diagnosed with dyslexia. After caring for a boyfriend who was injured in a car accident, McCarthy decided to work as a Licensed Practical Nurse. Later she married and she and her family lived in Mineola. On December 7, 1993, her husband, Dennis, was killed, and her son, Kevin, was severely injured on a Long Island Rail Road commuter train at the Merillon Avenue station in the village of Garden City, when 35-year-old Colin Ferguson opened fire on passengers. Ferguson killed six and wounded 19 others. McCarthy responded to the crime by launching a campaign for more stringent gun control that eventually propelled her to Congress in 1996 on the Democratic ticket. She defeated freshman Republican Dan Frisa by a large margin. In the biographical 1998 television movie The Long Island Incident, which portrayed these events, she was played by actress Laurie Metcalf. During her time in Congress, McCarthy was described as "the doyenne of anti-gun advocates in the House" and "the fiercest gun-control advocate in Congress". She made attempts to broaden her policy portfolio, but was never able to entirely shed the label of being a one-issue congresswoman. She acknowledged this, saying in 2009 that although she is also known for her education and district work, she is still the "gun lady". McCarthy was a registered Republican before her first run for Congress, although she ran for office as a Democrat and "evolved" over the years into a reliable Democratic vote. She has voted with her party 98.1 percent of the time during the 111th Congress. McCarthy's husband Dennis was murdered in the racially motivated 1993 Long Island Rail Road shooting, which first prompted her to run for Congress. McCarthy was one of the nation's most vocal gun control advocates. In 1997, she sponsored a bill requiring trigger locks on guns. After the 1997 Empire State Building shooting, she introduced legislation to ban the sale of guns to tourists visiting the United States; afterwards, she received "threats serious enough to require police protection during most public appearances". Later that year, McCarthy unsuccessfully opposed a Treasury bill provision that allowed the importation of weapons that had been modified in order to be compliant with the federal assault weapons ban. In the aftermath of the Columbine High School massacre, McCarthy proposed a bill that would require firearms to be child-resistant, would make it more difficult for young adults to purchase guns, and would regulate gun shows. After the Federal Assault Weapons Ban expired in September 2004, McCarthy introduced the Assault Weapons Ban and Law Enforcement Protection Act of 2007 to reauthorize it in February 2007. On April 16, 2007, after the Virginia Tech shootings, McCarthy issued a press release calling for "legislation to prevent further acts of gun violence". Shooter Seung-Hui Cho had passed a background check despite his mental health issues owing to an inconsistent sharing of records between the federal and state governments. McCarthy introduced (H.R. 2640, the NICS Improvement Amendments Act of 2007) to remedy this problem. The bill, with the support of the National Rifle Association, was passed by the House and signed by President Bush. McCarthy said her next priority was closing the gun show loophole. In January 2012, McCarthy along with Senator Dianne Feinstein from California proposed a bill which would "ban the sale, transfer, manufacturing of importation of 150 specific firearms including semiautomatic rifles or pistols that can be used with a detachable or fixed ammunition magazines that hold more than 10 rounds and have specific military-style features, including pistol grips, grenade launchers or rocket launchers." McCarthy spoke on the bill saying, "The American people are on our side this time, and we do outnumber some of the people who are fighting against us this time." On a 2007 episode of MSNBC's program Tucker, Tucker Carlson interviewed McCarthy about the Virginia Tech massacre and her proposed reauthorization of the Federal Assault Weapons Ban. She said that the legislation would ban large capacity "clips" of the type used in the Virginia Tech massacre and that the class of guns chosen prohibited by the law were those used by gangs and killers of police officers. When pressed, she admitted that she did not know the function of a barrel shroud, which was also included in the legislation, incorrectly identifying it as "A shoulder thing that goes up." McCarthy voted in favor of the Iraq War Resolution in 2002. In 2006, she voted in support of a Republican resolution in support of the war. In her 1996 race, McCarthy said she was against the death penalty but added that she wouldn't support repeal because her district supported it. McCarthy is one of the strongest advocates of hearing loss detection, prevention, and treatment. A former nurse, she has repeatedly championed the Hearing Aid Tax Credit Act (H.R. 1646 in the current session of Congress - www.hearingaidtaxcredit.org), which is designed to help those with hearing loss to afford hearing aids. McCarthy consistently supported a pro-choice abortion platform. In 1997, McCarthy voted against a ban on late-term partial-birth abortions. In 2003 she was rated 100% by NARAL, and in 2006 she was rated 0% by the NRLC; both scores indicate a strongly pro-choice stance. In 2003, McCarthy introduced legislation prohibiting companies from compelling the retirement of older employees and denying them pension and benefits. McCarthy, who has dyslexia, testified in support of the Individuals with Disabilities Education Act and co-sponsored an act to fund early detection of dyslexia. In September 2007, McCarthy supported an increase of $35 billion for the State Children's Health Insurance Program (SCHIP), the national program to provide health care for children from families who earn too much to qualify for Medicaid but cannot afford private health insurance. She said, "No child in the 4th Congressional District, Long Island, or anywhere throughout our nation should ever go without medical care." The increase passed but was later vetoed by President Bush. McCarthy was a supporter of federally funded stem cell research but restricted to the use of embryos that would be discarded. In 2007, she supported the Stem Cell Research Enhancement Act which did just that[clarification needed]. It passed both the House and Senate but was later vetoed by President Bush. On November 4, 1999, McCarthy voted in favor of the Gramm-Leach-Bliley Act. In a 2011 press release, McCarthy expressed her sentiments on the Tea Party, saying "It's time to stop letting the Tea Party hold the House of Representatives hostage." The Fourth District and its predecessors had been in Republican hands since 1953, even though Nassau County as a whole has supported Democrats for President since 1992. In 1996, the district's first-term Republican incumbent Dan Frisa was running for re-election at the time that McCarthy testified at a congressional hearing against an ultimately unsuccessful Republican attempt to repeal the Federal Assault Weapons Ban in a congressional hearing. After Frisa voted for the repeal, McCarthy, a lifelong Republican, announced she would run against him in the primary. However, local Republican officials showed no support for her candidacy. So, with the support of the local and national Democratic parties, and the endorsement of Newsday, the local daily newspaper, McCarthy ran as a Democrat and defeated Frisa by seventeen points. Afterwards, some Republicans tried unsuccessfully to persuade her to run as a Republican in 1998. She faced a close fight for reelection in 1998 against state assemblyman Gregory Becker, but did not face serious opposition again until 2004. That year, she faced Hempstead mayor James Garner. The race was expected to be competitive, but McCarthy won easily, taking 63% of the vote. Although McCarthy has always served as a Democrat, she did not change her voter registration from Republican until 2003. Before the election, it was reported that Democrats were concerned that McCarthy was in danger of losing her seat. In the end, however, McCarthy defeated Republican challenger Francis X. Becker, Jr, by a margin of 54% to 46%. Earlier in 2010, it was widely reported that McCarthy was considering entering the 2010 special senatorial election to challenge Senator Kirsten Gillibrand, owing to the latter's support for gun rights. Gillibrand had been appointed to the seat on January 23, 2009 by Governor David Paterson to succeed Hillary Clinton, who had left the Senate to become Secretary of State in the new Obama Administration. McCarthy commented, saying: "I've spent 15 years trying to prevent gun violence in this country, and if he [Paterson] does pick her [Gillibrand] and if no one goes and primaries her, I will primary her." She said she would not let New York be represented by someone with a 100% rating of the NRA. On Hardball, McCarthy said that she thought Gillibrand was working for the NRA. On June 4, 2009, however, McCarthy announced that she would not mount a primary challenge to Gillibrand. In early 2012 there was a question as to whether redistricting might eliminate McCarthy's district. In the end, her district was left essentially intact. Third party candidates omitted, so percentages may not add up to 100%. McCarthy announced on June 3, 2013, that she has a treatable form of lung cancer. On November 8, 2013, it was reported that McCarthy, who had smoked cigarettes for 40 years, was suing more than 70 companies claiming that she had developed lung cancer from asbestos. Her father and brother, whose clothes she washed, worked with asbestos. This was challenged by New York Times columnist Joe Nocera, who claimed McCarthy was part of a growing trend of cigarette smokers suing companies that once used asbestos, citing her nearly lifelong "pack-a-day" habit as evidence that she was knowingly bringing a bogus case and partaking in a widespread "asbestos scam." ^ Walter, Geoffrey (January 8, 2014). "McCarthy will not seek re-election". Wantagh-Seaford Patch. Retrieved July 8, 2016. ^ a b Barry, Dan (1996-07-13). "L.I. Widow's Story: Next Stop, Washington". The New York Times. Retrieved 2013-07-14. ^ Marks, Peter (December 15, 1993). "Train Shooting Victim Speaks For First Time Since Injury". The New York Times. Retrieved 2013-07-14. ^ Kleinfield, N. R. (December 7, 1994). "A Year Later, the Demons Remain; Fear Still Haunts L.I.R.R. Shooting Survivors". The New York Times. Retrieved 2013-07-14. ^ "Stick to Your Guns, Senator". National Review. 24 February 2009. ^ "Carolyn McCarthy unveils gun-control bill". Politico. 13 January 2011. ^ a b "Carolyn McCarthy (D-N.Y.) U.S. Representative (since January 1997)". Washington Post. 2012-07-24. ^ a b U.S. Congress House of Representatives. "List of Standing Committees and Select Committees and Their Subcommittees of the House of Representatives of the U.S. : Together with Joint Committees of the Congress with an Alphabetical List of the Members and Their Committee Assignments" (PDF). Retrieved 2 October 2013. ^ a b Barry, Dan (1997-06-22). "An Icon Goes to Washington". The New York Times. Retrieved 2013-07-14. ^ "Threats Are a Price For Backing Gun Control". The New York Times. 1997-05-07. Retrieved 2013-07-14. ^ Brazil, Jeff; Berry, Steve (November 15, 1997). "Clinton Imposes Import Ban on Assault Guns". Los Angeles Times. Retrieved 4 January 2013. ^ Gray, Jerry (1997-09-18). "Gingrich Tries to Rein In Ally On Big Spending for Highways". The New York Times. Retrieved 2013-07-14. ^ Bruni, Frank (1999-05-05). "Senate Looks for Clues on Youth Violence". The New York Times. Retrieved 2013-07-14. ^ Mitchell, Alison; Bruni, Frank (1999-06-17). "House Undertakes Days-Long Battle On Youth Violence". The New York Times. Retrieved 2013-07-14. ^ "Rep. McCarthy Statement on Virginia Tech Shootings". Carolyn McCarthy. 2007-04-16. Archived from the original on 2007-06-30. Retrieved 2008-01-31. ^ a b Palank, Jacqueline; Urgina, Ian (June 14, 2007). "House Votes to Bolster Database on Gun Buyers". The New York Times. Retrieved 2008-03-29. ^ McCarthy, Carolyn (January 24, 2012). "Lawmakers Unveil New Assault Weapons Ban". The Washington Post. ^ "'Tucker' for April 18 - Tucker - MSNBC.com". Msnbc.msn.com. April 19, 2007. Retrieved 2008-09-06. ^ "Final Vote Results For Roll Call 455". Clerk of the United States House of Representatives. 2002-10-10. Retrieved 2008-01-31. ^ Palmer, J. Jioni (2006-06-17). "Breaking ranks on Iraq". Newsday. Archived from the original on February 17, 2008. Retrieved 2008-01-31. ^ Barry, Dan (1996-11-06). "Widow of Rail Shooting Victim Defeats Incumbent in Emotional Contest on L.I." The New York Times. Retrieved 2013-07-14. ^ "Carolyn McCarthy". On The Issues. Retrieved 31 May 2012. ^ Treaster, Joseph B. (2003-05-31). "Legal Experts Say Allstate Lost a Battle In Agents' Suit". The New York Times. Retrieved 2013-07-14. ^ "Testimony Before the Committee on Education and The Workforce". Carolyn McCarthy. 1998-05-13. Archived from the original on 2007-02-01. Retrieved 2008-02-05. I have a learning disability -- dyslexia. But I went to school at a time when children with disabilities were swept under the rug. ^ "H.R. 73 [107th]: Early Prevention of Dyslexia in Children Act of 2001". GovTrack. Retrieved 2008-02-05. ^ "Rep. McCarthy Votes to Provide Health Insurance for Long Island's Children". Carolyn McCarthy. Archived from the original on 2008-01-31. Retrieved 2008-02-05. ^ Pear, Robert (October 6, 2007). "A Battle Foreshadowing a Larger Health Care War". The New York Times. Retrieved 2013-07-14. ^ "Rep. McCarthy Statement on Stem Cell Research Vote". Carolyn McCarthy. Archived from the original on 2008-01-31. Retrieved 2008-02-05. ^ "H.R. 3: Stem Cell Research Enhancement Act of 2007". GovTrack. Retrieved 2008-02-05. ^ "GovTrack: House Vote on Conference Report: S. 900 [106th]: Gramm-Leach-Bliley Act". Govtrack. 1999-11-04. Retrieved 2010-07-12. ^ "Tea Party Republicans Block Vote to Decrease Taxes for 160 Million Americans". House Bio. Archived from the original on 2012-04-21. ^ "United States Presidential Election Results". Dave Liep's Atlas of U.S. Presidential Elections. Retrieved 2008-01-31. ^ "Personal Plea on Gun Ban". The New York Times. 1996-03-22. Retrieved 2013-07-14. ^ Toner, Robin (1996-10-12). "Hurled by Tragedy Into Public Life, a Novice Learns to Cope". The New York Times. Retrieved 2013-07-13. ^ Dao, James (1996-08-28). "A Woman Comes to Politics Via Personal Trial". The New York Times. Retrieved 2013-07-13. ^ "1996 U.S. House of Representatives Results". FEC. 1996-11-05. Retrieved 2008-01-31. ^ Lambert, Bruce (1996-11-07). "Crossovers for McCarthy". The New York Times. Retrieved 2013-07-13. ^ Halbfinger, David M. (1998-11-05). "McCarthy Is Re-elected by a Slim Margin". The New York Times. Retrieved 2013-07-14. ^ Gootman, Elissa (April 29, 2003). "McCarthy Quietly Changes Registration". The New York Times. Retrieved 2013-07-14. ^ Bazinet, Kenneth R. (2010-10-25). "New York Democrats anxious as Long Island Rep. Carolyn McCarthy, other pols face barrageNew York Democrats anxious as Long Island Rep. Carolyn McCarthy, other pols face barrage". New York Daily News. ^ Danny Hakim; Nicholas Confessore (January 24, 2009). "Paterson Picks Gillibrand for Senate Seat". The New York Times. Retrieved 2013-07-14. ^ "150 Minutes With Carolyn McCarthy". NY News and Feature. ^ Kleefeld, Eric (2009-06-04). "McCarthy Not Challenging Gillibrand In 2010 Senate Primary | TPMDC". Talking Points Memo. Retrieved 2010-07-12. ^ Lovett, Kenneth (2012-02-08). "L.I. Rep. Carolyn McCarthy's district on the chopping block". New York Daily News. ^ Gendar, Alison; Lovett, Kenneth (2012-02-09). "Redistrict plan may put McCarthy in uphill battle". New York Daily News. ^ "New York House District 4 – Previous Election Results". The Post-Standard. Archived from the original on 2013-02-04. Retrieved 2008-02-03. ^ "Statistics of the Congressional Election Of November 8, 1994". Clerk of the House of Representatives. 1994-11-08. Retrieved 2008-02-03. ^ "Rep. Carolyn McCarthy says she has lung cancer". WABC TV. Retrieved 3 June 2013. ^ Nocera, Joe (2013-12-02). "The Asbestos Scam". The New York Times. Retrieved 2015-06-23.